The Bianchi Accumold 7235 Nylon Belt System is a tough, fully-featured 2.25-inch wide duty belt system designed for law enforcement use. It includes a duty belt, liner and six integrated belt keepers. Bianchi's rig is made from an extremely durable, five-part laminate material, including a ballistic nylon weave outer layer that resists daily wear. 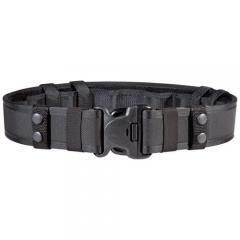 The internal stiffener provides additional load-bearing strength for carrying holsters and other belt-mounted accessories, without worry of sagging. The stiffener is surrounded by dual layers of closed-cell foam, enhancing wearer comfort. The Coplok® polymer buckle is shatter-resistant and features an ultra-secure, three-point release that remains closed when under tension. Great system and price. Very comfortable. Could be more comfortable for the price of the item. Meets my needs not my expectations.